Ranthambhor is situated 12 km from Sawai Madhopur in Rajasthan. Dating back to 994 A.D., this well-preserved imposing fort is perched atop a hill at an altitude of over 200 meters amidst a dense forest. The structure comprises huge walls and colossal gates. Ruined pavilions, walls, chhatris and splendid monuments are interspersed within the majestic fort. 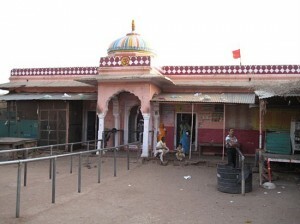 An 8th century A.D. Ganesh temple on an open land attracts thousands of devotees and is the venue for an annual fair held on Bhadrapad Sudi Chaturthi, fourth day of the bright half, in the month of Bhadra. This entry was posted in Rajasthan, Ranthambhor and tagged Ganesh temple, ranthambhore india. Bookmark the permalink.